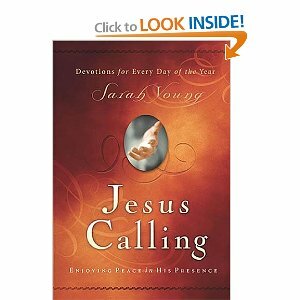 I’ve heard a lot of good things about the devotional Jesus Calling by Sarah Young, and bought it from Amazon a couple of weeks ago. It is so good. Today’s devotional struck home: I need God every moment. “You need Me every moment. Your awareness of your constant need for Me is your greatest strength. Your neediness, properly handled, is a link to My Presence. However, there are pitfalls that you must be on guard against: self-pity, self-preoccupation, giving up. Your inadequacy presents you with a continual choice – deep dependence on Me, or despair. The emptiness you feel within will be filled either with problems or with My Presence. Make Me central in your conciousness by praying continually: simple, short prayers flowing out of the present moment. Use My Name liberally, to remind you of My Presence. Keep on asking and you will receive, so that your gladness may be full and complete.” ~ Sarah Young, Jesus Calling, p. 55. Are you empty? Are you in despair? Come to Him and let Him fill you.